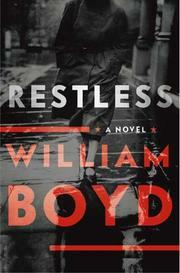 Atmospheric novel about an older woman whose past career as a WWII spy has come back to haunt her. Ruth Gilmartin is a single mother of one in 1976 England. On a visit to Grandma’s, Ruth’s mother, Sally, informs her that her real name is Eva Delectorskaya, and that she was an agent of British Intelligence during World War II. Eva hands Sally a manuscript of her story, abruptly launching the duo and the reader into the past. Boyd (Any Human Heart, 2003, etc.) seems more eager to tell Eva’s story than Ruth’s. Not surprisingly, as the elder Gilmartin finds herself swept into a world on the brink of war in 1939. Recruited by the swarthy and mysterious Lucas Romer, Eva is trained in spycraft and joins Romer’s team, specializing in disinformation. Propaganda is Eva’s stock in trade, and she has a knack for it. Still, for all her talent, she finds herself attracted to her secretive boss. Boyd has obviously read a few espionage novels. Can any young woman resist James Bond? Ruth leads a far less glamorous life. Saddled with Jochen, her inquisitive son, she teaches English as a Second Language. Her adventures occur vicariously, through the lives of the foreign students who study with her. With a nod to irony, Ruth teaches people to blend into their surroundings. At first, her mother’s revelation seems to be a sign of senility. As Ruth begins to investigate, the shadows of her mother’s former life reveal themselves. There is some truth to this work of fiction, and the real-life events make for a fascinating backdrop. Boyd skillfully manipulates language as easily as Eva does. He handles the plot more roughly. Ruth is clumsy albeit untrained, and the other characters in her world are rather thinly sketched. Yet Boyd fits the puzzle together neatly in the end. A bit light on action and intrigue, but a cool, collected effort.